Elenwen is an Altmer sorceress and First Emissary of the Thalmor in Skyrim. She resides in the Thalmor Embassy, in Haafingar hold. She often hosts lavish parties at the embassy, inviting Skyrim's most influential and powerful people. You infiltrate one of these parties during Diplomatic Immunity, using an ill-gotten invitation. During Season Unending, she is part of the Imperial delegation—along with General Tullius, Legate Rikke and the Jarl of Solitude Elisif the Fair—that attends the Peace Council at High Hrothgar. At the start of the council she will say that she has every right to be at this negotiation because she needs to ensure that nothing is agreed to that violates the terms of the White-Gold Concordat. Ulfric Stormcloak vehemently objects to having a Thalmor representative at the table, and will demand that she leave, though it will be up to you to decide whether she stays or not. Letting her stay makes the Imperials happier with the overall truce, but causes Galmar Stone-Fist to nearly storm out. On the other hand, her departure makes the Stormcloaks happier, but angers Legate Rikke. Other than this incident, she has no real role in the negotiations. Elenwen wears Thalmor robes, Thalmor gloves, and Thalmor boots. She wields a leveled dagger, which can be up to glass in quality. She knows a number of spells, namely Stoneflesh, Conjure Storm Atronach, Chain Lightning, Fireball, Ice Storm, Fast Healing, and Steadfast Ward. In casual conversation, she will mention several subjects, such as her duties as First Emissary "My duty is simple - oversee the Thalmor Justiciars, and make sure they perform their duties admirably." She will speak of the White-Gold Concordat, too; "The Empire, in its wisdom, has come to recognize Talos worship as a barbaric remnant of a bygone age." She will also mention her perspective on Tiber Septim and his godhood; "Talos was a heroic man, but not a god. It pains the Altmer that we must remind our younger cousins of the difference." She will also indicate Imperial sympathies in the war, but will deny affiliation in any other dialogue "We only want what is best for Tamriel. Surely, the rebels will accept peace when they realize this." Since she was at Helgen, she could also mention recognizing you at any time "I could swear I've seen you somewhere before..."
When entering the Thalmor embassy, Elenwen will approach, suspicious of this unknown guest, and will greet you by saying: "Welcome. I don't believe we've met. I am Elenwen, the Thalmor Ambassador to Skyrim. And you are...?" My name is <Alias=Player>. Pleased to meet you: "Ah yes. I remember your name from the guest list. Please, tell me more about yourself. What brings you to this... to Skyrim?" Quite a party. It's my first time, you know. Where can I get a drink? : "Don't worry, my parties are always well-stocked with the finest food and drink available in this country. But first, you were introducing yourself. Please, tell me more about yourself. What brings you to this... to Skyrim?" You're Elenwen? I've heard so much about you! : "Have you? All good, I trust. But you have me at a disadvantage. I'm afraid I know nothing about you... Please, tell me more about yourself. What brings you to this... to Skyrim?" At this point Malborn will interrupt the conversation. "Madame Ambassador, I'm so sorry to interrupt..."
Malborn: "Madame Ambassador, I'm so sorry to interrupt..."
Elenwen: "What is it, Malborn?" Malborn: "It's just that we've run out of the Alto wine. 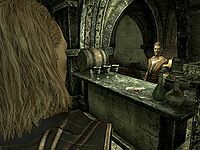 Do I have your permission to uncork the Arenthia red..."
Elenwen: "Of course. I've told you before not to bother me with such trifles." "I trust that this is just the beginning of a long and mutually beneficial relationship." "I'm so glad you could attend today." "I hope you're enjoying yourself." "Please, help yourself to more wine." "The hospitality of the Thalmor Embassy is at your service." What's your position on the civil war? : "As long as the Empire continues to uphold its treaty obligations, my government does not concern itself with the internal politics of Skyrim." I can see you spared no expense: "Of course not. One does not gather the most important men and women of Skyrim and then serve them cheap ale and stale bread. This is only a taste of the benefits that accrue to those that align themselves with Thalmor interests." 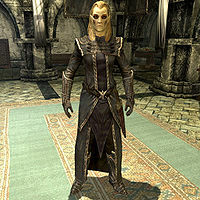 I've never quite understood exactly what the Justiciars do: "The Thalmor Justiciars are so often misunderstood. Our primary goal is to preserve the peace between the Empire and the Aldmeri Dominion. The worship of the false god Talos contributed to the unfortunate friction that led to the Great War. Following the Great War, the White-Gold Concordat set out the terms for peaceful coexistence between the two powers. The Empire and the Dominion agreed that the worship of Talos was a relic of the past, and must be eliminated in the interests of peace. But I'm sure you didn't come here for a lecture on high politics." Do you host these parties often? : "Quite often, yes. The only thing I enjoy more than luxury is sharing that luxury with those who can appreciate it. But I also enjoy learning the latest gossip and hear [sic] the most intriguing rumors." What does your position as Thalmor Ambassador involve? : "One of my main duties is to foster a better understanding between the Aldmeri Dominion and the people of Skyrim. I also oversee the activities of the Thalmor Justiciars throughout Skyrim, although this has been unfortunately disrupted by the war." If you speak to her before taking your seat at the Greybeard's council table, in addition to her standard dialogue, she will also recognize you as the infiltrator from the Embassy, and will say, rather ominously "And so we meet again. But this time I know who and what you really are." Shortly after Ulfric Stormcloak gets angry due to Elenwen's presence at the peace council, she will stand up for her right to be there by saying: "I have every right to be at this negotiation. I need to ensure that nothing is agreed to here that violates the terms of the White-Gold Concordat." Either General Tullius or Ulfric (depending on your chosen side in the Civil War) will then ask you if she should leave or stay. If you decide she must leave, Elenwen will get up from her seat and say: "Very well, Ulfric. Enjoy your petty victory. The Thalmor will treat with whatever government rules Skyrim. We would not think of interfering in your civil war." After this final line of dialogue for this choice, she will leave High Hrothgar. The rest of the dialogue in this paragraph is only heard if you choose to let her stay. Ulfric states that she must not participate in the negotiation, but only listen. After Elenwen hears this, she will say to Ulfric: "Ulfric, why so hostile? After all, it's not the Thalmor that's burning your farms and killing your sons." causing Legate Rikke to question whose side she is on. Shortly after this, Esbern will give a speech, which Elenwen will comment on, saying: "A very pretty speech, but what does it have to do with..." Elenwen will then be cut off halfway through the sentence, either by Ulfric saying "Shut up." or Tullius saying "That's enough out of you. ", depending on which of them is getting the short end of the stick in the negotiations. She is voiced by Jean Gilpin. 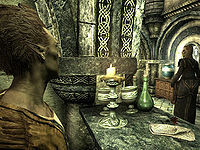 Elenwen is introduced in the opening sequence of the game during the wagon ride into Helgen. She can be seen just inside the entrance to Helgen with her bodyguards talking with General Tullius, much to Ralof's dismay, "Look at him. General Tullius the Military Governor. And it looks like the Thalmor are with him. Damn elves. I bet they had something to do with this." Elenwen can be killed following completion of the main quest. Rarely, she can be seen outside of Helgen right after you exit the cave with Ralof or Hadvar during Unbound. She will act like she has already met you in the Thalmor Embassy. Although not directly involved in the quest, Elenwen also plays a part in Elisif's Tribute, as the one who sent Agent Lorcalin. If you get back into the Thalmor Embassy following completion of the main quest, she will make comments about how she's seen you somewhere before. Unused dialogue sheds light on the conversation she has with General Tullius in Helgen. "General Tullius, stop! By the authority of the Thalmor, I'm taking custody of these prisoners." "Your Emperor will hear of this. By the terms of the White-Gold Concordat, I operate with full Imperial authority!" "You're making a terrible mistake!" This page was last modified on 20 January 2019, at 18:18.